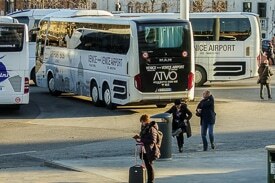 ABOVE: ATVO airport buses arrive and depart at Venice's Piazzale Roma. INSET BELOW: The ATVO/ACTV ticket counter in Marco Polo Airport. ATVO, a regional bus company, has comfortable coaches with room for your luggage beneath the passenger compartment. Buses run nonstop between the airport and Piazzale Roma. See page 2 of this article for information, photos, and Web links. ACTV, the Venice public-transit agency, operates the Linea 5 "Aerobus" to Piazzale Roma, with local stops along the two-lane road from Mestre. See page 3 of this article for details. Both ATVO and ACTV run frequent buses to the railway station in Venice's suburb of Mestre, on the mainland, where express trains connect with cities in Northern and Southern Italy. See our Mestre Airport Buses article for details. ATVO operates buses to the Lido di Jesolo, Treviso, Caorle, Aviano, and other towns in the region. These depart from a pedestrian island outside the D doors of Marco Polo Airport's arrivals level, near the Venezia Piazzale Roma and Mestre airport buses. For more information, see the ATVO Web links on page 2. If you're headed for a military base, such as the U.S. Army Garrison at Vicenza, check with the base ahead of time for a shuttle timetable and departure location. If you're with a tour group, look for your guide or tour leader in the arrivals terminal, or follow the instructions that you were given with your tour materials.